Transmaxillary approach to the orbital floor has been used successfully to treat the blowout fracture by antral packing to support the orbital floor. However, antral packs are associated with a high incidence of infection and persistent oroantral fistula. A 30-year-old man with a history of the orbitozygomatic complex fracture 8 years ago presented with a persistent facial wound on the right side of the cheek. 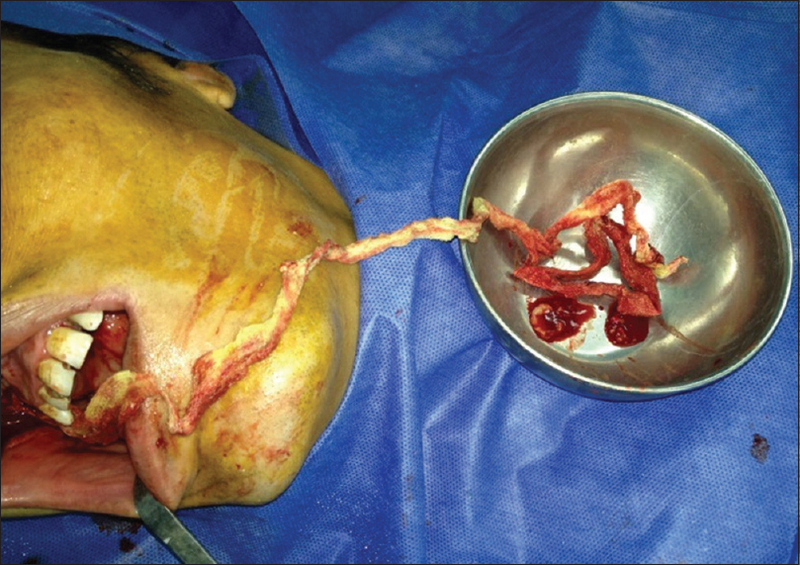 The patient underwent an exploratory surgery under general anesthesia, and the maxillary sinus was approached through the Caldwell-Luc operation and a long 2-m nasal tampon was found in the sinus. Foreign bodies including gossypibomas are rare, hard to diagnose, and mostly asymptomatic and in chronic cases do not reveal specific radiological and clinical signs for differential diagnosis. Therefore, in the evaluation of the soft-tissue lesions in patients with a history of a prior operation, it is wise to consider foreign bodies in the differential diagnosis. Orbital floor fracture, regardless of whether it is blowout type or trapdoor type, is common in facial trauma, resulting in a wide range of consequences. Surgical repair is generally indicated for cases with esthetic problems or impaired eye movement. In 1972, Walter reported the transmaxillary approach to the orbital floor, and Park et al. in 2015 was also reported this approach in a case report. The blowout fracture was treated successfully using the Frazin gauze packing to support the orbital floor for 7 days., Although antral packs are associated with a high incidence of infection and persistent oroantral fistula, formerly it was believed that there are obvious indications for the antral packs, such as grossly comminuted fractures or where an external procedure is not indicated. Nondental origins of sinus foreign bodies are rare, and only a few cases of nondental paranasal sinus foreign bodies have been reported in the literature. This paper reports a case of chronic maxillary sinusitis caused by forgotten antral packs, which provokes a diagnostic challenge. This case also can be considered as intentional gossypibomas, which went wrong due to either lack of patient's compliance or physician's negligence. Hence, iatrogenic foreign bodies require special attention due to the unique circumstances involved and their rare occurrence. In April 2016, a 30-year-old man was admitted to the Department of Oral and Maxillofacial Surgery, Tabriz Dentistry School, complaining of a persistent facial wound on the right side of the cheek. The wound was appeared 6 months ago and had not responded to the previous treatments such as antibiotics and electrocautery; hence, the patient was concerned about the malignant nature of the wound. The patient had no medical history of systemic diseases. The patient was diagnosed with a right orbitozygomatic complex fracture 8 years ago during a motor vehicle accident and treated surgically by an otolaryngologist surgeon. Clinical examinations revealed a depressed wound sized 1 cm and located under the malar prominence 1 cm from the right commissure [Figure 1]. Tenderness, swelling, and pus discharge were absent. There was no significant intraoral finding in examination unless reactive denture induced hyperplasia in the right maxillary vestibule. The results of orthopantomography showed a periapical lesion around the root of a severely decayed maxillary lateral incisor, which was not related to the patient's complaint. A 4-hole miniplate fixed with three screws was also seen in the right infraorbital rim. The screws were in good condition and seemed to be firm and stable in their positions. A computed tomography scan was taken in coronal and axial views to rule out intrasinus pathology. The right maxillary sinus was filled with an opaque material and the osteoma was obstructed. Destruction of the medial sinus wall and intranasal and ethmoidal sinus involvement was also evident [Figure 1]. There were radiolucent areas inside the main lesion, which could be a sign of air entrapment or emphysema. There was radiolucency around the most distal screw, which had no relationship with the lesion. Numerous pathologic conditions could be included in the differential diagnosis, such as chronic maxillary sinusitis, fungal infections, and malignancies. The patient was scheduled for an explorative surgery under general anesthesia, and the Caldwell-Luc surgery technique was used to approach the maxillary sinus. A window was prepared in the canine fossa area and the contents of the sinus were removed. Interestingly, a long 2-m nasal tampon was found in the sinus, which was covered with pus, blood, and granulation tissue [Figure 2]. All the granulation and polyploidy tissues were removed, and the sinus was rinsed with copious amount of normal saline. Cutaneous wound was curetted and sutured. Vestibular incision was sutured. The postoperative period was uneventful, and the patient was discharged the day after the surgery with oral medications including antibiotics (cloxacillin, 2000 mg/day), and a nonsteroidal anti-inflammatory drug plus acetaminophen (diclofenac sodium, 150 mg/day plus acetaminophen 2000 mg/day), and decongestant nasal spray. Six months after the surgery, the patient was symptom-free, and the facial scar was healed appropriately. With advances in bone grafting techniques and internal fixation, absolute indications of using antral packing for supporting the unstable fractures of orbital floor have been changed. Materials such as balloons, Penrose drain material, plastic tubing, and strip gauze impregnated with antibiotic are the most commonly used materials for this purpose. The packing materials are usually retained for 14 days then removed in increments daily. Several complications have been reported with the use of intrasinus packing such as infection, increased infraorbital nerve damage, blindness, and oroantral fistula. Most of these complications are caused by over packing due to difficulty in determining the amount of packs necessary to produce proper pressure. Maxillary sinus foreign bodies are rare entities, but they can be considered in differential diagnosis with rhinosinusitis, especially when sinusitis occurs unilaterally. Estimating the frequency of the maxillary sinus foreign bodies is difficult due to the rarity of the entity besides the small numbers of series published. It is believed that foreign bodies produce chronic chemical and physical irritation of the mucosa, causing degree of ciliary insufficiency and finally infection. Maxillary sinusitis and severe infection are predictable outcomes of prolonged retention of the pack. Although small foreign bodies, such as vital root tips, can be retained in maxillary sinus without significant signs and symptoms, remaining of a silent huge strip gauze for 8 years is a really uncommon event in spite of dramatic consequences reported due to forgotten iatrogenic foreign bodies such as many cases of gossypiboma. Foreign bodies of maxillary sinus often have a dental origin caused by manipulation, or secondary to an oroantral fistula. However, leaving an iatrogenic nondental foreign body for 8 years is far rarer. Gossypibomas are rare, hard to diagnose, and mostly asymptomatic, especially chronic cases, which do not reveal specific radiological and clinical signs for differential diagnosis. Hence, in patients with a history of a prior operation, it is wise to consider foreign bodies in the differential diagnosis. Matsuda Y, Sakaida H, Kobayashi M, Takeuchi K. Successful application of endoscopic modified medial maxillectomy to orbital floor trapdoor fracture in a pediatric patient. Auris Nasus Larynx 2016;43:575-8. Walter WL. Early surgical repair of blowout fracture of the orbital floor by using the transantral approach. South Med J 1972;65:1229-43. Park MW, Kim SM, Amponsah EK, Lee SK. Simple repair of a blow-out fracture by the modified caldwell-luc approach. J Craniofac Surg 2015;26:e306-7. Finlay PM, Ward-Booth RP, Moos KF. Morbidity associated with the use of antral packs and external pins in the treatment of the unstable fracture of the zygomatic complex. Br J Oral Maxillofac Surg 1984;22:18-23. Sahin YF, Muderris T, Bercin S, Sevil E, Kırıs M. Chronic maxillary sinusitis associated with an unusual foreign body: A case report. Case Rep Otolaryngol 2012;2012:903714. Pagella F, Emanuelli E, Castelnuovo P. Endoscopic extraction of a metal foreign body from the maxillary sinus. Laryngoscope 1999;109:339-42. Lata I, Kapoor D, Sahu S. Gossypiboma, a rare cause of acute abdomen: A case report and review of literature. Int J Crit Illn Inj Sci 2011;1:157-60.